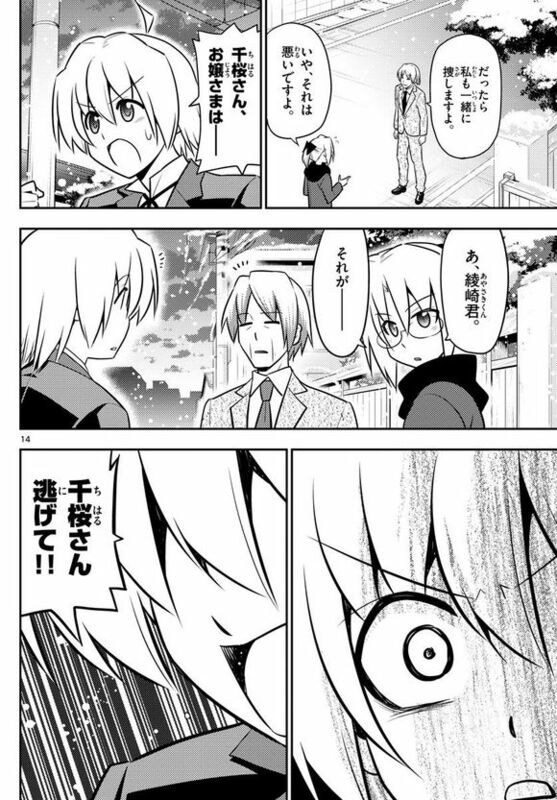 I like how desperate Hayate is to search for Nagi in this chapter. Also, broken mirror seems to be an allusion to the sinking of S.S. Hamster. The final chapter of THEIR STORY, fools! Isumi: With this, we can stalk whoever opens the path to the Royal Garden from here. Sakuya: Ah yeah, we can definitely get some detailed info with this but... is this ok? Isumi: It's fine. There's nothing we can't see using this right now. We'll definitely see when the path opens. Sakuya: It's not about that. This is the finale so let's not carried away, k? Sakuya: But, you can see inside, but what about communication? Isumi:S'wright, We got that too. We'll be using that. Sakuya: Is this thing safe? Isumi: S'awright. using this, you can speak directly through your consciousness. Sakuya: I see but... sorry for complaining but I dun get it. Isumi: Anywayz, just try the earphones on. Sakuya: oh, sugoi! The words are echoed directly from your head. Isumi: and with this helmet on, the output is increased. Sakuya: Oh, I'm getting an image. This is some great VR stuff. Isumi: Anywayz, Hayate should have one of these earphones too. A-tan: We can even find our enemy's location. Ayumu: Ha... tomorrow is Christmas Eve huh? Ayumu: Hakuo Academy's Christmas Party is coming up huh? Ayumu: Eh, a Christmas Party to lift Nagi-chan's spirits? Chiharu: It turned into something big. Hina: Will you come, Ayumu? YOu're more than welcome. This is a normal greeting in the Ayasaki Household. Ayumu: Th-thank you but I... have prior engagements. Ayumu: What should I do... I wonder. Ayumu: No... there's nothing that I can do. Ayumu: There's Nagi-chan's party at Hakuo, right? Hayate: Eh? Ah, yeah, that's it. Hayate: And I don't think I can go with you guys. Ayumu: Eventually... things fall into place. Many things have happened over the past year. On that day that I went looking for Hayate-kun, that was the day that Hayate-kun met Nagi-chan for the fisrt time. Eventually, the future came closer. Athena's flashback: When I looked into his eyes, I understood. I was no longer reflected in his eyes. Ayumu: It's ok. Do your best to cheer up Nagi-chan. Have fun! Ayumu: Anyway, I'll be going back to my Parents' home for Christmas Vaction. Bye Bye, Hayate-kun! Ruka: Now everyone! Lez get excited! Fumi: Uwaaa! Sharna-chan Sharna Chan! Somehow, this is really exciting! Sharna: Stahp it... just stahp! Hina: WAIT! WTF IS UP WITH THIS COSTUME! Miki: Someone had to be santa, right? Chiharu: Dude, we even got fireworks now? Hayate: Excuse me! BUT HAS ANYONE SEEN MAI OJOU-SAMA!? 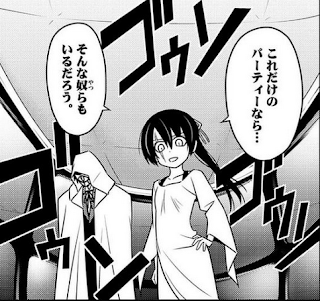 Hayate: She said she'd go to the bathroom but she suddenly disappeared! Hina: Eh? How about her phone!? Hayate: I can't get through to it. Kayura: Maybe she went home? Chiharu: I guess it's possible. Chiharu: It can't be helped. I'll check the apartment. Ayasaki, you go to the mansion. Klaus: This is bad! I know where Hisui is! Mikado: Well, spill it! Where? Himegami: Once, that old man used that unlucky guy's misfortune to open the road. Hisui: In this party, there's bound to be such a person, right? Hisui: Well then are you comin? Hisui: Oh hai guyz? Didja miss me? Butler guy: Sakuya-sama! That king's jewel above is opening the path! Sakuya in virgin-killing sweater: WHAT!? Peoples 2: wtf is that? Isumi: I shall exterminate thee! Hayate: Chiharu-san... how about there? Shun: Well, well... isn't it the party today? Shun: Eh? 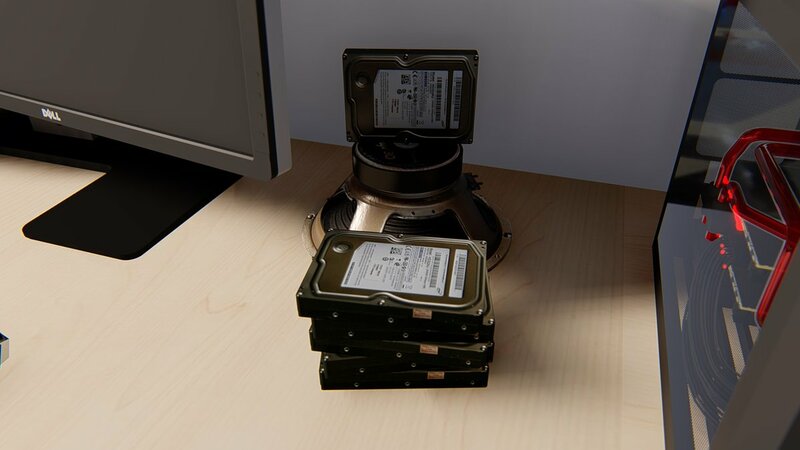 Well, that's not good. Shun: If that's the case, then I'll help look too. Hayate's dad totally deserved it...maybe? Chiharu: Thanks, sorry for the bother. Hayate: Chiharu-san: OUTTA THE WAY! Chiharu: What are you doing, Ayasaki kun? Hayate: What am I doing? Hayate: What have you done, dad! Shun: Ah... I've been found out. Text: Together with Chiharu is... Hayate's dad? Next issue: SHOCK! Review: All right... kid's gloves off. The other ships have no qualms about criticizing our ship left and right, so I'm gonna speak my mind without reservations as well in this review -- not that I plan to criticize other ships though. We're better than that -- we've always been. Well, we're certainly moving at a fast pace. From December 10 in the previous chapter, it would seem we're already at December 23 if we go by Ayumu's declarations. 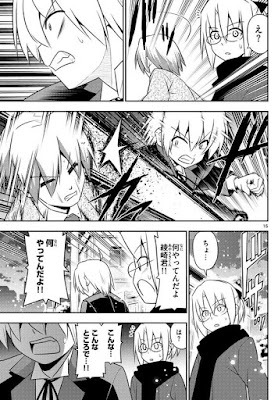 Like I predicted in chapter 555, The real estate guy trying to buy the Violet Mansion for his company really was Shun Ayasaki AKA Hayate's dad... as Hayate has so accurately PUNCHED the statement home in this chapter. Now it's pretty easy to take a wild guess and say that Nagi's disappearance was because Shun kidnapped her, but I don't really think so. 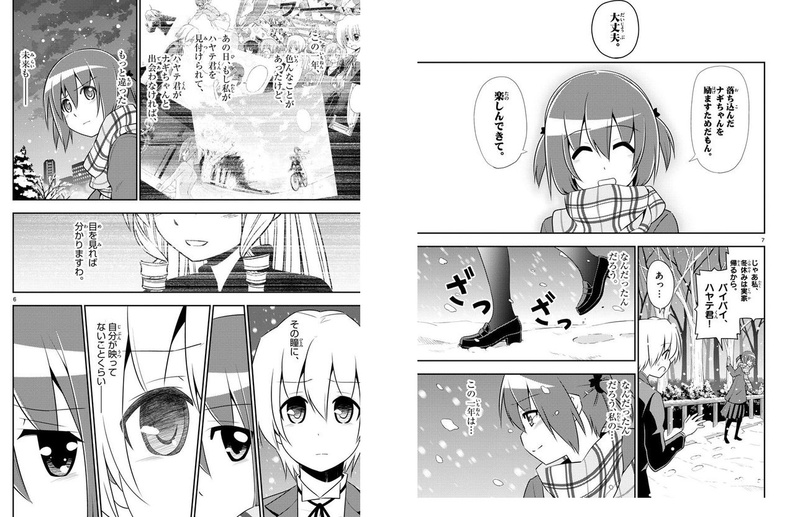 I'd like to believe that Nagi willed herself to "disappear" from Hayate's sight for a while. For what reasons? Well, there are a number of possible reasons, but let's wait for the manga to clarify this point. The reason I want to believe this is partly because I want Shun Ayasaki to be a reformed man... or at least one who is trying in this manga. I mean, if an assassin who killed hundreds of people in the Tokugawa Era could reform himself as a mild-mannered defender of justice in the Meiji Era... why can't Hayate's parents -- or at least his dad do the same? "When you're together, there will always be misunderstandings, but real love doesn't succumb to misunderstandings. Forgiving someone and being forgiven. That's what binds people together... and that's what the story is all about." In other words, I want Nagi to have one last moment of awesome before this manga ends... and I'm sure Hata-sensei won't disappoint in this regard. Also, even if Hayate's dad hasn't reformed, I still want Hayate to learn to forgive him... from Nagi. After all, that's one way of moving on -- a concept that many people have a hard time coming to terms with. Forgiveness isn't about the other person, it's about Hayate himself accepting that what has happened (some things when broken can never be repaired) is the past and that he is better than his past self. This would also prove that his dad -- his parents, can no longer affect him, no matter what they do, they have no more power over him: this is what forgiveness is all about. Based on the pacing of the last few chapters, there is definitely that rushed feel to the story -- but let's not condemn Hata for something he hasn't done yet -- and that is: write an unsatisfactory ending. Just because the story seems rushed right now doesn't mean that at least the core plot (core story IMO being what happens to Hayate and Nagi and not your King's Jewel's intricacies, sorry) won't be resolved satisfactorily. I believe based on ma-- errr... some anonymous commenter's response that there is still time to set off the "bomb between them" and go into a final "within the Royal Garden" mini-arc to end things with a bang. There is some faint possibility to this theory -- but I would call this sort of development quite cheap. It would also destroy all the developments so far with Nagi's independence and Maria's acknowledgment of said independence with her act of departure... which brings me to my next point. On one hand, based on Nagi's current depression, we could call Maria's sudden unannounced departure quite irresponsible. On the other hand, another way of seeing it is that she is the one who has been closest to Nagi -- arguably even more than Hayate. She has witnessed Nagi's incredible growth and transformation over the past year. So definitely, she probably knows Nagi a lot more than we give her credit for. It might seem like her decision was irresponsible right now, but it can also be seen as her final act of trust and acknowledgment of Nagi's growth. She trusts that Nagi will be fine even if she does this. Yes, she might have to cope with the pain of loss for a while, but Nagi has already proven her strength of character -- and perhaps this is what spurred Maria's decision to leave; because she had faith that her ward is much better than most people give her credit for -- much better than most readers of this manga give her credit for. Just because Nagi looks depressed right now doesn't mean she's totally regressed to the way she was in the past. People don't work that way. I trust Hata-sensei at least knows this much. If you've been reading this manga for years, shouldn't you at least put a little faith in the author when he hasn't even finished it yet? I am presenting another side of the coin -- another way of interpreting her actions. How you view it is up to you -- I choose to be positive. You may blame Hata for being a horrible, horrible writer all you like if it helps you sleep better at night. Credits to Roop Banerjee for finding this. This is great stuff and is based on things actually in the manga as opposed to interpretations of stuff in the manga -- which a lot of people seem to have a habit of doing. There are many more examples like this as well as chapters with almost same titles. Bye, Hamster! You were a nice Hamster till the end. Ayumu's ship was sunk rather unceremoniously. Also, she gave the nod to Nagi by thinking about Athena's words and making the connection that Hayate met Nagi on the day that Ayumu went searching for him. By the way, Christmas Eve is the most romantic day in Japan. I think we have more than enough of these "random moments" which seem to be meant to develop the groundwork for Hayate x Nagi --- to at least speculate that these are actually NOT SO RANDOM MOMENTS intentionally written in by Hata-sensei and intentionally littered throughout key moments in the manga. Yes, Hayate never saw Nagi as a romantic prospect in any of these moments -- AGAIN, must I repeat myself over 9000 times that this is an intentional plot design intended to distinguish Nagi from everyone else? The ROMANTIC GROUNDWORK or SCAFFOLDING or SUPPORT PILLARS or FOUNDATION or whatever the fudge you want to call it, doesn't necessarily have to consist of lovey dovey moments of Hayate going all gaga for Nagi (this is me, btw). They just have to logically lay out the FRAMEWORK for an ending that supports the assumption that Oh... I dunno... maybe...perhaps...somewhat...by some twist of fate... Hayate might see Nagi as a girl sometime? Yeah, that's all we Nagi shippers need. Not the lovey dovey ideal moments of smoochie woochies that you have in your head as the ideal "ONE TRUE LOVE" scenario. Again, this has been going on since the level 5 arc. Hayate felt that something was off about their relationship. The narration explicitly said that "they lack love." More accurately, they lacked reciprocal romantic love because Hayate never reciprocated Nagi's romantic love for him. So right now, again, I present another side of the same coin. You say that Hayate only sees Nagi as a sister? I say Hayate doesn't know how he feels about Nagi because he's never reflected on her initial "confession" through her manga and even after knowing about the misunderstanding through Chiharu. Hayate is being evasive about Nagi's feelings and that is why we see all these moments of confusion from him. You say it's only because he feels guilty? My friend, what a wonderful story you have in your head... I'm being sarcastic, just in case you don't get it. One thing that surprised me about Hisui's attack is that we all thought that the final battle already happened -- but it seems she really didn't do anything until now. Also, it's very surprising that Hisui hasn't considered the possibility that Nagi could open the path. She's had Yozora stalking Nagi and company since forever, so one would think she might know about the misunderstanding -- but this doesn't look to be the case. Either that or she doesn't want to hurt Nagi in the process of acquiring everything for herself. In any case, it looks like she's almost succeeding in opening the path to the Royal Garden -- now... there does not seem to be an "explosion of negative emotions" just yet, so Nagi and Hayate's own bomb is still set to go off. Nagi still has that King's Jewel that Wataru gave her after all. To end things on a positive note, I'd like to believe that Hayate no Gotoku! Is actually a formulaic love story -- something that people coming in with all kinds of unrealistic expectations can't seem to accept. IMO it's a lot closer to stuff like Urusei Yatsura and Inu Yasha from Rumiko Takahashi. There can be ships, but the author makes it clear who the one true pair should be from the start. Reading back on Hayate no Gotoku! The key moments of awesome are always reserved for Nagi and Hayate always treats Nagi special (YES I know you'll hit me with your plates of platonic again) and I mean very special when compared to all the other ROMANTIC PROSPECTS in his life. This HAS to be intentional somehow if it's been happening since the start of the manga, right? 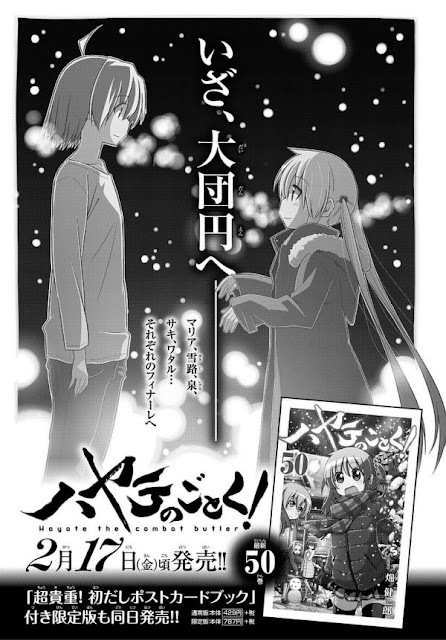 Anyway, I'd like to believe that amidst the fan pandering of the Prisma Illya's and the Yuri on Ice's, the full-blown harem antics of the To Love Ru's and the Nisekoi's, there is still a place for the simple boy meets girl love story with a little twist that is Hayate no Gotoku! Fanart Corner: Yeah, I've got quite a few today including another one drawn for me for Valentine's day by Denzil. I'm buying this figure when it's available. PREORDER OF COURSE! AMV Corner: I'm adding in this AMV made by a friend of mine here. It's so rare to see a Hayate x Nagi AMV after all. Whether it be age or any other reason why hayate won't approach Nagi romantically, the contrasting characteristics of hayate really amaze me. A few chapters ago, he didn't want to see nagi because he felt too awkward to face her. Yet when the possibility of not seeing her anymore actually arrives, he becomes desperate to find her, to be with her. It's interesting how the author draws this approach-avoidance conflict in hayate when Nagi is concerned. Yup, he's really a walking mass of contradictions -- and yet people still fail or simply refuse to acknowledge something this simple and obvious. It's not that HE ONLY SEES HER AS A SISTER. It's that he can't substantiate his real feelings for her. He's avoiding the issue to death for reasons that we can only speculate about for now. I think hisui will probably kidnap Nagi with those skeletal arms of king Midas (like it's drawn in nagi's manga) just as nagi opens the path. Since explosion of negative emotions is required to open the path, hisui will probably take Nagi along with her to the royal garden. I'm not sure whether it'll actually happen but I think it would be thrilling if it does. It would be nice... but I don't want Nagi to be just a damsel in distress even if she does get kidnapped. She needs a shining moment of awesome just like in CTMEOY for a really great ending. No way! Not a damsel in distress, but rather using her wit against hisui. Using her intelligence to strike the right pillar or something like that. If Nagi does indeed open the path and hayate gets involved too, she might figure out the right pillar and direct hayate to strike it. His brother struck it, he might get a chance too. I recently felt that each of the love rivals are chosen very carefully. Ayumu represents the urge for a simple and normal life of hayate. Sure he is not going to lead a normal life. Athena is nearly worshipped by the small and weak hayate. He wanted to follow her to some extent to get rid of his problems. But he can't catch up her level of intelligence and simply put, their mindset do not match that much. Hina..a perfect girl , is the contrary of his silly deeds and imperfections. But as shown in the manga, isn't imperfection is a crucial point of his character that makes the story go on! Ruka is an idol, excluding her family bonds (mostly), she has achieved her goal . Nagi declared she is someone that everybody wants to be. 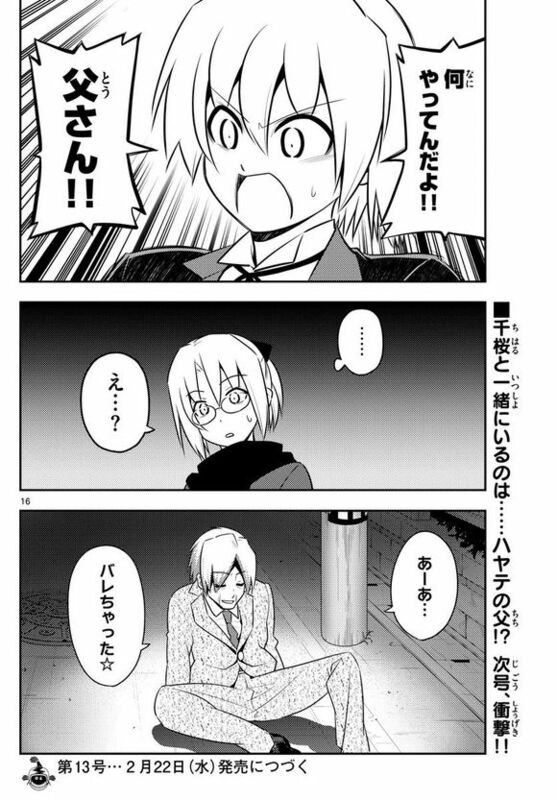 Hayate's proneness towards misfortune is just its opposite side while they both are hard workers. Izumi.... maybe similar to the cute quotient that hayate has. At some point I feel,indivisually their's and his characteristics (similar and opposite) combined, are not something stable that can mix up, overlap and still exist together which will be good for everyone. Nagi has some qualities from each of them, but still a unique indivisual. Her insight and his outer abilities together saved them many times. I am not criticising other ships, truly. It's only my perspective that hayate has met girls from different aspects, each of whom explored some of his characteristics (hidden or shown). But he devolops nice bond with nagi (maybe yet to devoloped fully) and chooses her. Maybe that is how the story is designed. 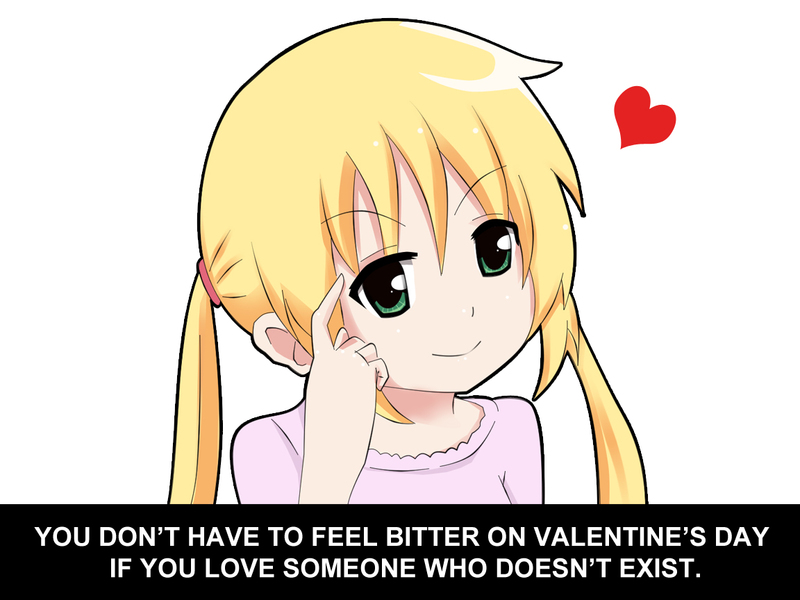 @meandanime: Very well said. I am in tears from reading your post. Also, we're not even the first to put out this theory. I remember someone from a certain forum saying basically the same thing but with different words about 2-3 years ago. I've also put out this theory some time ago that Nagi represents different facets of the traits that Hayate admires in all the other girls in his life. When you put it this way, the love story is actually very brilliantly constructed even if it seems like it's being rushed right now. I still have faith that Hata-sensei can write in a satisfactory -- if not downright brilliant ending. Oh yes, after you mentioned in your article that nagi has some qualities of others, I started to think it that way. I forgot to mention, sorry. And about the first portion, I started the manga few months ago ( though watched the animes long before that) so I have not read that theory before. "It's simple. Everything is for you"
Haha! I started out the same way. I saw the anime long before but only started on the manga a few years ago. My first review was for ch. 413 -- at that time, I wasn't even sure if I wanted to support Nagi, but as I read more of the manga, it was the only ship that I could really support. 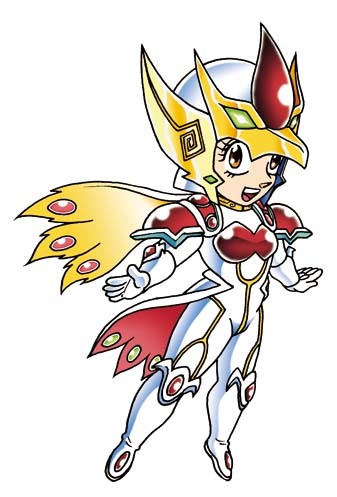 Nagi was just that amazing as a character for me -- and she still is. Thank you for sharing your views here. It's great to read some fresh perspectives from someone who is newer to the fandom. I wonder when ayumu recalled Athena saying that she is no longer reflected in hayate's eyes, whether ayumu actually felt like nagi was being reflected in his eyes. I zoomed so much and tried to demarcate a silhouette of nagi in his eyes. I guess only those in the manga universe will be able to find out. But I would like to think that a rough sketch of Nagi was there. I don't know... pretty sure that Athena thinks so anyway. Also, one indication that Ayumu was thinking about Nagi is that she mentioned how the day Nagi met Hayate was the day that she couldn't find him. She saw him that day but only in the morning, I guess. After that, she found him but after a long time. Anyway, she probably gave up after she saw the reciprocity in hayate's eyes towards Nagi. But I'm glad that hayate had at least got to know ayumu's feelings. And now because everyone's ship except Nagi's is sunk, haters would rather have a no pairing end just because it makes the most "logical sense" (read as: for spite) ... or maybe just for spite... yup. I wish people would drop the pretense and just come out and say they don't like Nagi rather than trying to justify their hatred. Yes. But a lot of valid reasons are required not to like nagi and i don't think there are any. Characteristics like selfish and immature, etc. are characteristics that we all have which is why nagi for me is the most relatable character. But she has grown so much from that and it makes me love her more. I don't understand how anyone can dislike her. By pretending not to dislike her, they can get away with it. They just need to say that she's now ok as a character, but she wasn't "developed" as a love interest for Hayate from the start while completely refusing our perspective on the subject -- which I probably explain every single review nowadays. Still, it looks more to me like sour-graping over sunken ships and wanting the main ship not to sail because of it. I think it's a rather consumerist attitude that's just about everywhere nowadays. People feel that creators actually owe it to them to give them the type of story they want otherwise, they'll huddle in groups, throw hissy fits and basically just spread thinly veiled hate posts in the guise of "valid criticism." Well, this was bound to happen. 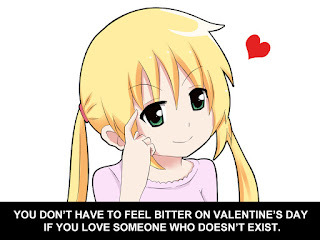 If hayate had responded to any other girl's feelings then the question of what made her different to the other girls would arise. I can't really compare between the moments, no matter how beautiful they were, that hayate spent with the other girls. Nagi's moments with him have always felt more special. Haha! So vol. 50 is out now and come with Sakuya and Hina postcards with them wearing Virgin-Killing sweaters... just when I recently draw Nagi in said sweater~ dat synchronicity! So here's a thought about what meandanime said about Nagi being a little bit of every girl that Hayate has liked... it actually ties in nicely with Roop's find that every romantic moment that Hayate has had with the other girls there was an intentionally similar situation with Nagi. This is what they call " Made For Each Other " I guess. Well, I guess we all think in a similar manner. What if the bomb never explodes? Wverything is resolved including Nagi's inheritance, the King's Jewels and all that extra stuff that Hata tacked onto this story. GOOD END and we skip to 10 years later to check in with everyone and witness the HayaNagi wedding. 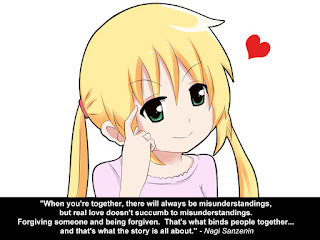 Whether the bomb explodes or not, I think Nagi should learn the truth about the misunderstanding. Since everything is getting resolved, I think it's important to get this misunderstanding resolved too; I'm sure many readers are waiting for the moment when Nagi finds out the truth. Also, hayate has concealed enough, it's time for him to be honest with everything that has happened and everything that he feels. You're right there. Everyone definitely wants Nagi to know the truth about the misunderstanding... Which doesn't mean Hayate has no feelings for her as some are so vehement to believe. They both get stuck in the RG with hisui and himegami . Nagi sufferes from the burst of negetive emotions to open the path. Each of them now has the KJ i.e, stone of bonds and stone which tests the greed. So midas is desperate to get back the royal power in the garden by using their greed. Hisui-himegami looses in the test of greed making the situation worse. But hayate and nagi refuse to be trapped and eagerly want to be freed from the castle immediately. They succesfully overcome all the problems and go through the process to release Nadza. In the midway they find the lotto's key. And after a loong and eventful day, the garden dissappears and they reach where even the meaning of love can be understood. 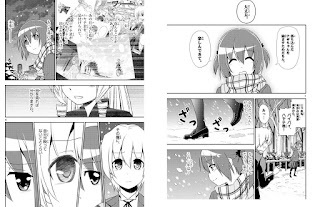 Hayate realizes his feelings, and nagi becomes tearful and apologises for bringing trouble . And thus she also fulfills mikado's condition of getting the inheritance. Yes. She looked like an older version of hisui with the similar expression of their eyes. 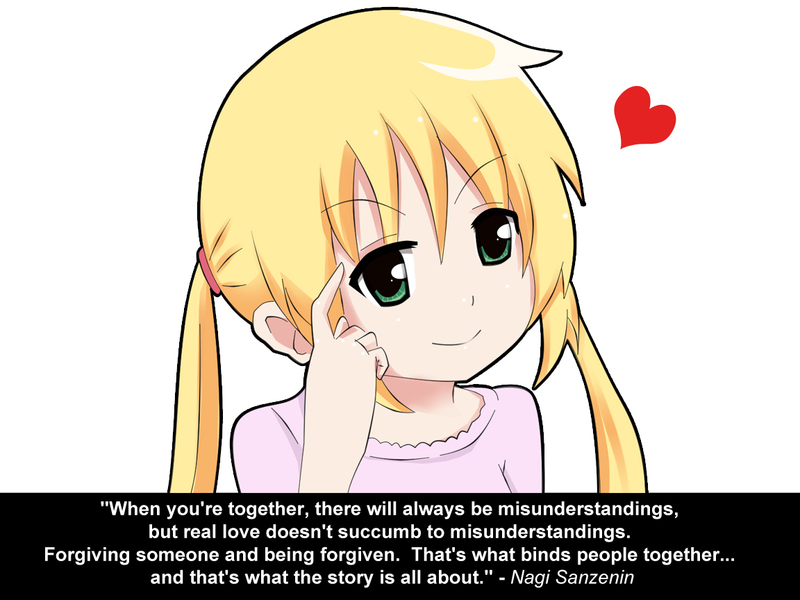 Nagi: A misunderstanding...? ah... ahahahahahaha! Nagi: Don't come near me, liar! Dare I say... Nagi end confirmed? Forgot to add: Nagi: Why aren't you here, Maria? Nagi" Don't come near me, liar!